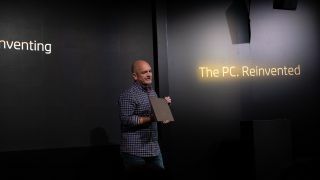 HP has shown off the HP Spectre Folio, a “completely new” device that it promises will reinvent computing as we know it, and is the most versatile convertible the company has ever made. While we were hoping for something a bit more revolutionary, HP is obviously proud of the device, with a design that it describes as “modern vintage meets technology”. The company, which was holding its PC Reinvented event in New York, claims that the convertible Spectre Folio is a premium laptop that goes beyond anything it has made before. In a bold statement, HP claims the Spectre Folio “basically has no flaws.” We’ll be putting that claim to the test soon when we get our hands on the device. At the launch event, HP made a big deal of the design of the Spectre Folio, with a leather build that not only feels premium, but helps make the Spectre Folio even more versatile. HP said it wanted to push the envelope when it comes to technology, and one of the design considerations revolved around designing a computer with a chassis covered in 100% genuine leather. By marrying metal and hide, the company believes it’s made a “truly transformative” form factor for the HP Spectre Folio. It also comes with a 4K touch screen with Gorilla Glass protection. HP claims that the HP Spectre Folio will last all day, running for 18 hours on a single charge. HP has managed to do that with an 8th generation dual core Intel CPU, and collaborated with Intel to create one of the smallest motherboards in the industry, so the HP Spectre Folio remains thin and light, with a huge battery life. It supports 4G LTE as well, allowing you to connect to the internet wherever you are. It will be available in US and major European countries, and ATT, Sprint and T-Mobile networks will be supported in the US. The HP Spectre Folio will go on sale for $1,400 in the US and £1,499 in the UK (about AU$2,700). Pre-orders start today, and the units will start shipping by the end of October. Keep your eyes on TechRadar for our hands-on review of the HP Spectre Folio.